Milan panorama seen from the roof of the Milan Cathedral, in the background the mountain range of the Alps. Satellite view showing Milan, capital of the Lombardia region in Italy. One of the largest Italian cities is located in the plains of Lombardy in northern Italy between the Adda and Ticino rivers. 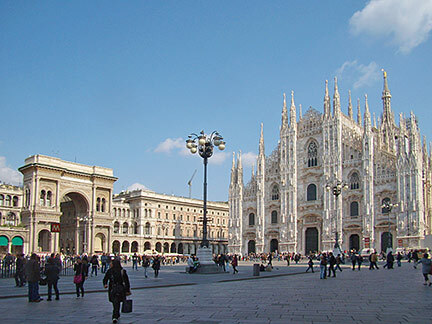 Piazza del Duomo, the white marble Gothic Milan Cathedral (right) is one of Milan's famous landmarks. To the left the portal to Galleria Vittorio Emanuele II, one of the world's oldest shopping malls, designed in 1861. The city was founded around 600 BC by a Celtic tribe. The region was conquered by the Roman Republic in the 220s BC. Milan became a Roman colony known as Mediolanum. The city was an important hub in the ancient road network of northern Italy. In 286 Roman emperor Diocletian moved the capital of the Western Roman Empire from Rome to Mediolanum. The city was an important center of the early Christian Church. Roman emperor Constantine issued his 'Edict of Milan' here in 313 which recognized Christianity and gave freedom of worship in the Roman Empire. Mediolanum was destroyed twice, by the Goths in 539 and in the 12th century by the Roman Emperor Frederick I. Today Milan is an international and cosmopolitan city, a leading financial and commercial center and one of Europe's main hubs for transportation and trade. The city has a population of about 1.34 million inhabitants (in 2016), more than 6 million people live in the Grande Milano Italy's most populous metropolitan area. The city is world famous for fashion and design. According to GaWC, Milan is ranked as an Alpha World City. The Map shows a city map of Milan with expressways, main roads and streets. Zoom out to find the location of Milan Malpensa Airport (IATA Code: MXP) situated 51 km (32 mi) by road, northwest of central Milan, connected to Milan by the Milano-Varese highway. Milan Linate Airport (IATA Code: LIN) 8 km (5 mi) east of the city center, and Orio al Serio International Airport (IATA Code: BGY) is located near Bergamo about 54 km (34 mi) north-east of Milan. Google Earth: Searchable map/satellite view of Milan (Milano), Italy. Milan's official tourism web site.